To get the very best improvements and longer term results for your skin and face, you should expertly combine and layer the best advanced skincare products and latest high-tech machines to give a truly bespoke treatment based on the individual client needs and concerns. In a bespoke facial I will use a variety of treatments including CACI, Radio Frequency, Skin Resurfacing, Microdermabrasion, Environ skincare, Mesotherapy and LED light therapy. I will create a bespoke treatment plan for you following a free 20 minute skin consultation. This gives the client the opportunity to tell me all about their skin, their concerns, areas they want to improve plus to ask questions about the treatments and products. This treatment includes using CACI non-surgical muscle toning and lifting to re-educate muscles, Radio Frequency skin tightening, Environ using the highest quality medical graded vitamins & peptides and LED light therapy. By treating both the muscles and the skin at the deeper layers with these amazing result-led brands you will get the very best anti-ageing treatment for prevention, treatment and maintenance. This treatment plan includes five 60 minute treatments and five 90 minute treatments – £590 of course of 10 treatments. Depending on how muscles react to the CACI treatment, this is completely different on each client with variances including age, skin condition, muscle tone etc. If additional treatments are required to achieve the desired result 60 minute treatments can be added up to 15 treatments. Deep cleansing and exfoliating this treatment to help with the acne, breakouts, congested skin and acne scarring. The combination of scientifically advanced products and LED blue light therapy will help to refresh your skin and help future breakouts. Specifically designed to lift and tighten the jowls and neck using CACI non-surgical muscle toning and lifting to re-educate the lower muscles of the face, combined with RF skin tightening treatment to shorten the collagen fibres and tightening the skin, then to complete this treatment pushing advanced anti-ageing products deep into the skin with either advanced cosmeceutical Environ serums or aesthetic Fusion needle-free Mesotherapy depending on the individual client needs. To help fight the signs of ageing around the eyes I have developed a bespoke eye treatment using a combination of CACI eye lift, Radio Frequency, Mesotherapy, Environ and pH formula re-surfacing. This unique treatment will be tailored to the individual clients needs to address; dark circles, lines/wrinkles, droopy/crepey eye lids, dehydration, puffiness. This treatment will include two homecare products for the client to take home and use everyday to enhance and achieve longer term results. This eye gel contains essential vitamins, antioxidants and specially selected peptides for use on the delicate and sensitive eye area. It assists in hydrating the skin and minimising the appearance of ­fine lines, helping skin to look younger for longer. – Enhance the effectiveness of the ingredients in topical Environ products. 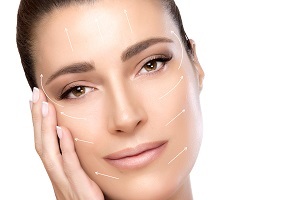 – Restore the look of skin tightness in the early stages of aging. – Speed up the reduction in the appearance of uneven skin tone and texture. – Reduce the appearance of fine lines and scars.